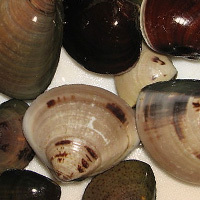 Korean hard clam or chosenhamaguri in Japanese is a type of shellfish that makes up 60 percent of the common orient clams gathered in Japan. It is common to be used in sushi. It is used in soups and decoration rice bowls. The calories in Korean Hard Clam per 20g(1item peeled) is 8 calories. Korean Hard Clam is calculated to be 42Cal per 100 grams making 80Cal equivalent to 190.48g with 1.3g of mostly protein、0.54g of carbohydrates、0.08g of fat in 20g while being rich in vitamins and minerals such as Vitamin B12 and Iron.